My latest promo illustration is my take on escalator etiquette and exploring some of the things we just wish we could say out loud. This technical illustration also showcases the “features” of an escalator though a phantom view of the working components. And in some cases it’s not always the safest or most pleasant ride up or down an escalator. But, here’s to hoping your escalator experiences are laughable! I designed a corrugate castle for the purpose of promoting the year of Harry Potter at an industry retail tradeshow. The following are also some point of purchase displays that I designed that you can find at your local Walmart, Best Buy or Blockbuster. Pick up your copy of Harry Potter and the Deathly Hallows TODAY! Designing the layout and look of a new iPad Application. A technical illustration cutaway of an office building featuring various mechanical components. Numerous plumbing illustrations for an illustrated home manual. A molding technology illustration of a MuCell process that shows the steps of how the process works. Beginning in May 2011 I will be working with a Sheridan College, Technical & Scientific Illustration 3rd year co-op student, Angela Yuqi Guo, to teach and mentor her about working freelance in this industry. I look forward to this opportunity to be a role model, as well as be inspired myself by an up-and-coming Technical Illustrator! With a simplistic re-design, www.leannekroll.com was just re-launched with updated portfolio pieces. I like to re-design http://www.leannekroll.com ideally, once a year. This allows me to update the artwork I show on the website, while also forcing me to keep up-to-date with the web developing software programs (ie. flash and dreamweaver). Not to mention, a large part of the business of Technical Illustration is marketing oneself and a website is the first impression that a potential client has on our skills as an Illustrator. If you have any comments or questions in regards to this blog, or the new portfolio website at www.leannekroll.com, please feel free to contact Leanne directly via the About section on the website or this blog. Thank you for taking some time to view the art at http://www.leannekroll.com! The latest edition of HOLMES Magazine is now available and I had the opportunity to work with Art Director, Patricia Cavazzini on technical illustrations for the article called “Get Smart”. This article discusses the new trend of smart home technologies where all electrical devices are connected and controlled by the homeowner from a single source (ie. a remote control or a wall panel device). The main illustration is a cutaway of a house that showcases the many features you could have that are all linked by the same smart home technology. The article gives advice to homeowners as to how they can go about creating their own smart home system, as well as the pros and cons of having a wired or wireless internal network. As a Technical Illustrator, it is always interesting to learn about different technologies. As a new home owner, I believe the smart home concept is a form of home automation I could easily learn to live with! A big thanks to HOLMES Magazine for also featuring me as a Contributor in this edition. I recently completed the cover illustration for Open Mind Magazine. The technical illustration was based on the main article regarding Public/Private Partnerships or P3 as it is more commonly known in short. The article discusses the advantages of Public/Private Partnerships (P3) in the construction and maintenance of schools, roadways, bridges and hospitals. Working with Art Director, Charles Burke on this project, the P3 became the structure of a construction site with the main elements that are discussed in the article. I wanted to keep a clean look to the final treatment of the illustration as a reflection of the simplicity of a P3 partnership. Centennial commemorative pin, and Upper Deck set of Centennial series trading cards. If you’re looking for a great Christmas gift for a Montreal Canadiens fan that you know or if you would like a collector’s edition for yourself, visit www.cbcshop.ca or look for it in stores! Leanne Kroll has been working hard lately re-designing her website with exciting new projects that she has recently completed. The website is NOW ONLINE and completely re-vamped, featuring recent new artwork. Please take some time to browse her indepth portfolio at www.leannekroll.com! Leanne is currently available for freelance projects. Although I have been quite busy with freelance technical illustrations lately, I have just completed a personal project more in the interpretive/abstract range. Check out the Current Projects page for more information on my February Sentiments project. I have challenged myself to step outside of my comfort level with detailed technical illustrations and pushed myself in a whole new direction! As it begins to get busier this Christmas season, it is always great to take some time out and enjoy the festive celebrations. As an Illustrator, it is always fun to be able to create your own Christmas card to send to clients, family and friends. This year, I have decided to illustrate an image that is fully vector-based, which forces one to think differently about the shapes that you are working with. Originally, I was thinking of illustrating something technical that reflects who I am as an Illustrator. In the end, I have designed something that speaks of who I am as a person. Believe it or not, I love snow and I wanted that to be represented in my card. I used various Illustrator brushes to create the affect of a snowfall. The circular shapes that make up the tree represent the various communities of individuals that surround me and support me on a daily basis. I used simple gradients to render the elements of the tree and the bright colors make it come to life. I had fun creating this illustration as I do with every project that I undertake and that is very important to me. Sometimes it isn’t about the final illustration that you produce as an Illustrator, but the process you go through to create an illustration that contains the most meaning. Happy holidays and all the best to you and yours this season! I have recently completed a technical illustration for HybridCars.com depicting the basic differences between plug-in hybrid vehicles versus standard hybrid vehicles. The purpose of this illustration was to assist consumers in their understanding of how the new technology of plug-in vehicles functions. An overall comparison was depicted between plug-in hybrids and standard hybrids, which on the website is differentiated with a roll-over application of the mouse. If you would like to learn more about this new vehicle technology, please visit the HybridCars.com website. 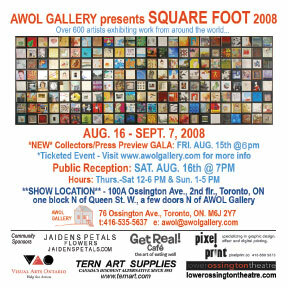 An overwhelming amount of artwork is currently on display by AWOL Gallery at the Square Foot 2008 show. The opening reception was held last night and it was worth slowly viewing all the pieces. Over 500 artists, myself included where depicted at this collective group opening. The name of the show, Square Foot, is symbolic because every piece must adhere to a square foot size of 12″ x 12″. The show runs from August 16 (opening reception) to September 7 and weekly the hours the gallery is open Thursdays to Saturdays between 12 Noon and 6pm; and Sundays between 1pm and 5pm. My two pieces in the show reside in grid numbers A141 and C111. All pieces at the show are being sold for $200 each, so if you find something you like it is a great deal! From the VW Engine that I recently finished painting, I have created three pieces to be put into the Square Foot Show which runs from August 16, 2008 to September 7, 2008. All pieces for this show must be 12″ x 12″ or one square foot. 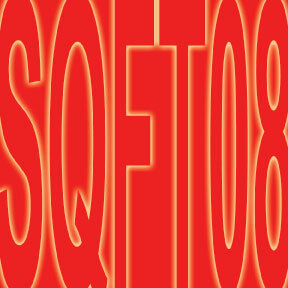 As a major group exhibit, there are 700 artists exhibiting at the 2008 Square Foot Show. As a sneak peak to the show, the following are the three pieces which I have selected to be in the show. Opening reception for the show is August 16, 2008 beginning at 6pm at 100A Ossington, 2nd Floor, Toronto, Ontario. All other day of the show from August 16 – September 7, gallery hours are Thursday to Saturday, 12 Noon to 6pm or Sunday 1pm to 5pm. In April, 2008 it was announced that Kodak would be sponsoring the 2008 Sheridan Graduate Show titled “The Language of Illustration”. In conjunction with the very generous sponsorship, Kodak was printing and distributing artwork in the form of posters at various shows worldwide. The first show is in Dusseldorf, Germany at Drupa 2008. At this show in particular, Kodak will be printing the posters on various technologies to display print quality to clients that would potentially buy the equipment. Recently I found a great article promoting the Kodak booth at the Drupa show which may be of interest to some. I personally have the following illustration which was selected for promotion at this show. Please take some time to read the article promoting the Kodak booth as an exhibitor at Drupa 2008 in Dusseldorf, Germany. I am honoured to have been able to sit down with Charlene Chua of Illustrophile for a personal interview on why it is that I love technical illustration. She found my desire to illustrate automotive, detailed subject matter interesting considering that I am a female. The questions she asks, I feel pushed my own personal vision of where I would like to head in the future and allowed me to reflect on my accomplishments to date. Some of my current illustrations are posted along with the interview, however if you would like to view a full portfolio please visit my website. This interview is now posted, so check it out! The 2008 Sheridan Illustration Graduate Show has now ended, but the website has since been updated! Check out Sheridan Headlines to see the new changes. Recently added is the section titled 2008 Graduate Work. Through the theme of rebuses for the show, rebuses that each student illustrated create the thumbnails for the artwork. All of my fellow students are featured on this website with a link to personal websites of each illustrator. Please take some time to check out the talented individuals who have now become professional illustrators! Charlene attended the Sheridan Grad Show and decided to feature me on her blog that is dedicated to lovers of illustration and commercial art. It is great to get recognition from a fellow illustrator! Charlene has now asked if she could interview me on how it is that I love technical illustration. Being a female, she finds it interesting that I am well-versed at illustrating automobiles, and other “manly” subjects. Stay tuned to find out when the interview will be posted on Illustrophile.